Dog nail trimming should be done once every 2 weeks for inactive House bullies and 3 to 4 weeks for active Outdoor bullies. If you’ve never trimmed your dog’s nails before, a good start to learn is to have a vet or professional groomer show you the proper way the first time around. Have them do the first two paws and then have them watch you do the second two. If done correctly, nail trimming will be completely painless for your dog (and for you!). The blade should always be sharp. The nail should be cut from underneath, not from the top downward. Slide the opening over the end of the nail while staying in the whitish part of the nail. The pink area of the nail is the live part and has blood vessels throughout. It’s a good idea to have some Kwik Stop on hand in case you cut too short. You do NOT want to cut the quick. A good guideline is to cut just until the curve or use a nail file. (Like the ones used in the nail shops.) It takes about 3 seconds per nail, once or twice a week, to keep the nails trim and smooth. the quick of the nail that will bleed if it's nicked or cut. The outer nail shell is made up of old growth and has no feeling. The meaty area is new growth in transition from the quick to the outer nail shell. The meat not as hard as the nail shell, and is not living flesh, like the quick. The quick is alive with nerve endings and blood supply. It can't be stressed enough that cutting into the quick will hurt your dog! 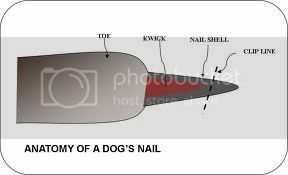 The quick stems from the base of the nail, narrowing as it gets to the meaty and dead areas of the nail. When grinding or clipping the nail, the outer dead shell is brought closer to the quick. The goal is to get and keep the quick as far back from the hard outer shell as possible. The easiest time to trim your dog’s nails is right after a bath, as the water softens the nail. Get your dog used to having its paws handled by following these tips. Rub between the pads of the bottom of the paw – this gets them used to having their paws touched. Use your thumb and massage the back of the paw gently in a circular motion. Gently squeeze the pad for three to five seconds – this gets them used to their paw being held. Scissor-type nail clippers (great for puppies and small dogs). Styptic powder (baby powder works too to stop the bleeding). 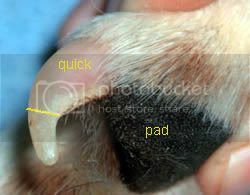 Are Your Dog's Nails Too Long - Avoiding the "Quick"
Visualize your dog’s paw resting down on an invisible horizontal line, where the bottom of the pads is barely touching the line. When viewing their paw from the side, if their nails extend below the invisible line you know they are too long. 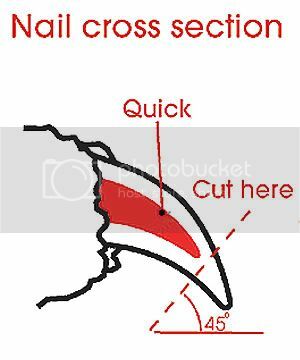 Your goal should be to cut away the extra nail below the invisible line, being careful to not cut the “quick.” The quick can usually be seen as a darker area within lighter-colored nails. Dog nail trimming essentially works the same for your dog as it does for you. When you cut your own fingernails, you will go pain-free as long as you don’t cut the part of the nail that is still attached to your skin. Cutting below the quick works the same way. If you do happen to cut the darker part (it happens to us all from time to time), the nail will bleed. It is a good idea to have a commercial blood coagulants (i.e. styptic powder) handy in case this happens (follow the package directions). As a rule, filing or trimming your dog's nails is better done in small amounts more frequently instead of large amounts every once in a while. Again, every 2 weeks for indoor house dogs and every 3 to 4 weeks for more active outdoor dogs should do the trick. Now, lets get the job done! Hopefully, your dog will sit still and allow you to trim or file away. As with any interaction, the younger you start dog nail trimming the easier it will be to get them used to it. You can also use your dog's kibble as a treat to take its mind off the trimming - this in turn will make your dog associate the trim with a treat. If your dog is a squirmier, you’ll need to hold them down or get someone else to hold them down. If you’re flying solo, it’s easiest to put them on a table and lean over them so you can use your body weight if necessary. Take a look at the color of your dog’s nails. If they are light and you can see the quick inside, use your clippers to cut just below the quick. If they are dark and you cannot see the quick, use the clippers but only cut very small bits off the end at a time. It’s time to stop when you begin to see the grayish-colored quick through the cut end of the nail. If you accidentally cut the quick, use the styptic powder to stop the bleeding. Be sure to brush away the excess powder - not doing so will make the seal more likely to break and cause the bleeding to resume. Note that the powder does sting for some dogs, so if your dog absolutely hates it, don’t worry about it. The nail should stop bleeding within 5 minutes. Use a nail file and work the end of each nail until they are soft (do not do this on nails that have bled). Don’t forget the dew claws! Those are the nails about 1 to 3 inches above the inside of the front (and sometimes rear) feet. 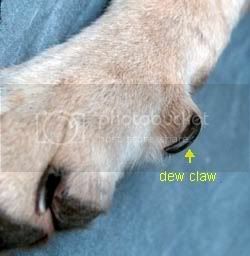 The dew claws never wear down since they don’t touch the ground. If the dew claws have grown into a circular loop, cut them with your scissor-type nail clippers first (being sure not to get too close to the quick), then go to work with the guillotine-type clippers and file as discussed above. Don't forget to PRAISE the heck out of your dog and give them their favorite treat after each session! 1. Help your puppy get accustomed to having her legs, feet and nails touched and rubbed for several days before actually doing any trimming. Reward the touching sessions with a doggie biscuit. 2. Choose the best type of trimmer. Puppies usually have small nails, so unless you have a large breed with thick nails, the same trimmers you use for your nails might work for them and for small, adult dogs. 4. File the nails with an emery board after trimming to smooth off any rough edges. This keeps the puppy from chewing on his nails so much later and helps keep your carpet and clothing snag free. A dremel is an invaluable tool to have; with a little practice, you can use a dremel to trim your dog's nails. Secure your dog. Every dog reacts differently to the sound and sensation created by a dremel, and until your dog becomes used to it, he may struggle or run away. A grooming table with an overhead arm to which you can attach the leash is optimal, but you can recruit an assistant to help hold your dog or you can tie your dog's leash to a post or other sturdy object. Hold your dog's paw firmly, but don't squeeze it (this is where the paw massage practice will come in handy). Push gently on the top of the dog's paw, just above one nail, to separate that nail from the rest. This pressure will cause the nail to extend slightly. If your dog has furry paws, smooth the fur back and away from the nail or trim the fur away before using the dremel. If the dremel catches in long fur, it can injure your dog's paw. Touch the spinning dremel bit to the tip of your dog's nail, using very little pressure. The momentum of the dremel will grind away the tip of the nail, and using pressure may cause the tip to slip and injure your dog. Move the spinning tip lightly around the end of the dog's nail, taking care not to place the bit too close to the skin or fur. Keep the hand that is holding the dremel moving at all times to reduce the risk of slipping. Speak reassuringly to your dog and take a break after a few nails, offering your dog a treat or praise for being so good before continuing. A few short sessions are less traumatic than one long session. Why Use a Dremel Instead of Clippers? Grinding or Filing is more comfortable to your dog than the guillotine-type clippers. You can get dog's nails shorter and smoother by filing, without pinching or causing pain in the quick. Guillotine-type clippers cut through the hard shell of a dog's nail with squeezing pressure, but be very careful as you can easily cut into the quick of the nail. If a dog's nails are not kept short, the quick grows towards the end of the nail, and causes pain in the small joints of the paw. When this happens, the toes of the paw begin to point inward (or outward) to relieve pressure from the nail tips. The paws look similar to arthritic fingers. White or light colored nails are the easier to trim than dark nails. The pink vein of the quick is visible in white nails. When trimming dark-colored nails you need to be extra careful to avoid the vein. To get nails shortened, several small clips are necessary, and hopefully, you won't cut into the quick. When the Dremel is properly used, your dog will not experience pressure on the quick within their nails. As you slowly grind towards the quick, you can actually see 'inside' the nail. Grinding around the quick helps it to recede and you can get shorter nails, over time. The closer you manage to grind to the quick (without cutting into it), the more it will continue to recede. When you finish grinding, be sure to smooth the corners and rough edges. Quick-stop styptic powder and Vaseline should always be kept on hand when doing your dog's nails. If you should grind too deep and cut into the quick, the styptic powder will stop the bleeding and subdue the pain. Rubbing some Vaseline on the nails after grinding, makes them shiny, it's just a vanity thing. Grind the nail tip perpendicular to the floor by holding the Dremel straight up and down. This way you can remove more of the hard nail and get closer to the quick without nicking the living tissue. Look at the position of your dog's paw and nail while they are standing. Then hold the Dremel perpendicular (using the floor and ceiling as your guide), and you'll see how to angle the cut. When you grind, check the nail often! Begin by lightly grinding straight across the underside of the nail. This will remove any rough edges. Then begin to grind off some of the top of the nail (from nail tip to the top outside of the nail). Then begin to grind vertically (re-read about the correct angle, above)! As you grind the tip of the nail, you will begin to see a two-textured arch, like an upside down “U.” This is the hard outer shell and the meaty area underneath. As you continue grinding, the hard shell will get smaller and the meaty area bigger. When you see a tiny white pin-point center in the meaty area, you are approaching the quick! At this point STOP filing the center area and clean up the nail edges. If you use a variable speed Dremel, use it on low setting so you don't create a lot of heat. 60 grit sanding rolls cut well without creating heat as well. Go slowly as Dremel sanding rolls cut fast. NEVER, ever press the nail into the grinding head or vice versa! Let the speed of the spinning grinder and the friction of the grit band do the sanding. Applying pressure will press on the quick, cause the nail to get hot, and give unnecessary pain to your dog. NEVER keep the Dremel in one spot longer than three seconds! And, never grind for more than three continuous seconds. Alternate between nails, and allow each one to cool before continuing to drill. Repeat the sequence until you have all the nails done on one paw. The goal is to shorten the nails, not give pain to your dog! ALWAYS support the toe and nail of the paw you're working on. Grinding creates vibration, and your dog will be more comfortable is you lessen this effect. Also, holding the toe gives you better control to prevent accidental grinding on the fur or paw pads. It's easier to maintain short nails, than to restore them back to short. 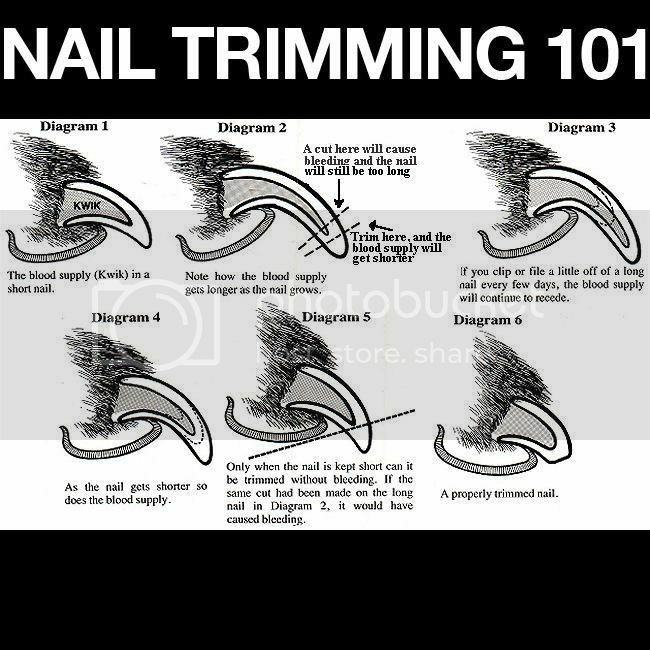 Once nails are allowed to grow long, you may never get the nails back without “quicking” them (cutting into the quick). Trimming your dog's nails is an important part of its regular grooming. Nails left to grow to long can break and cause pain and bleeding. Long nails that break off may also splinter like a hang-nail creating more pain for your pet. There are several ways to keep your dog's nails trim, but one of the more popular ways is to use a dremel to file down the nail. It is very easy to get carried away with a dremel because it sands so quickly. Be careful not to go too deep and grind into the quick (the vein that runs partway down the nail of your dog). Watch carefully as you grind and stop immediately at the first sign of blood. Do not let blood be your only guide to depth of the grind. Know where you want to grind to on the nail when you start. The heat and grinding action of the sander may hit the quick and cauterize at the same time so that you do not see blood when the vein is hit. Instead, you may end up going even deeper into a wider section of the vein before you see blood begin to flow, at which point it will be very difficult to stop the bleeding without the aid of a veterinarian. If this happens, wrap the paw tightly and apply pressure while getting your dog to the vet as quick as possible. Clip the hair around your pet's nails before grinding to keep it from getting caught and pulled during filing. wow! very interesting, does anybody here use the grinder? sounds like it might be a good choice. I have the scissor type. yes, and I love it. Musch less streeful for my Emma than going to place of business to get it done. i love my dremmel its so fast compared to that pedi paws crap. The dremmal is such a wonderful easy tool to use when doing their nails. Wilson broke part of his nail off this past weekend and out came the dremmal to round it out. Anna (@acarabia) I use both the regular style Guillotine clipper and then follow it up with the dremmal for a nice smooth finish. Bye the time I'm done with Wilson he's nearly asleep. I have to fight him in the beginning though but I win. All my dogs have always been the same at first. Heck they still don't really care for it but they do tolerate it. It takes a lot of time and patience to get them to settle down for it. Wilson really fought me at first and in a firm way I would just tell him "I always win" and I would let him settle down and we would try again. I never let him leave my arms and flee though. At first Wilson may have taking me about 1/2 hour to do his nails now we're done in less than 10 minutes and he's on his back now and quite relaxed by the time we're done. Just keep at it and don't give up. So much information in ONE artical !!!!!! Just did all the kiddos nails a bit ago, Emma is getting so much better! this info was great! I struggle every time I cut my bullies nails! Im going to look for a dremmal! thanks!